Read below to find out how to make the most of this helpful fishing and hunting resource. When you first arrive at the TU Map, you will see the entire world (this is the default view). To zoom in (+) or zoom out (-) use the buttons in the lower right of the map. To change the position of the map, you can click and hold while you move your mouse in any direction. This will move the map view in whatever direction you choose. If you double click on the map, you will zoom in on the part of the map you click on. There are six different colored markers on the map. The light brown markers represent Fishing Access Sites, red markers represent Guided Trips, blue markers represent River and Lake Reports, green markers represent Guide Reports, yellow markers represent Outfitters, and the dark brown markers represent Destinations. When there are multiple markers in one location, you will see a cluster with a number and one or more colors. 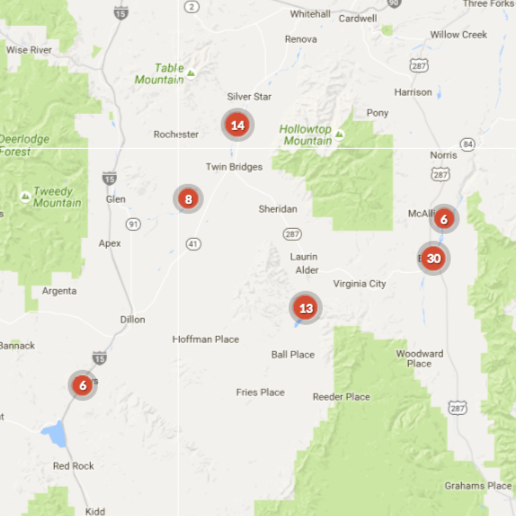 The number denotes how many places and/or resources there are at that location. When there are multiple colors in a cluster, it means there are multiple types of places and/or resources represented. If you click or zoom in on a cluster you will see the specific locations of the places and resources represented in the cluster. By default, the TU Map shows you all the places and resources available for each map view. To toggle which types of places and resources you want to see, click on the legend in the lower left corner of the map. You can select one or multiple places and resources you would like to see and the map will show only the items you select. When you click an individual colored marker, a box will pop up with information about the place or resource you selected. The selections include Access Sites, Trips, River and Lake Reports, Guide Reports, Outfitters, and Destinations. Each is described in detail below. Access Sites – When selected, the Access Site Pop Up will show you the name of the access site, reviews (if any), and a link to more information on that access site. If pictures are available for that access site, you can use the left/right arrows to see other pictures that are included of the access site. Below the name and description of the access site you will see a link to the Fishing Water Reports for that access site. 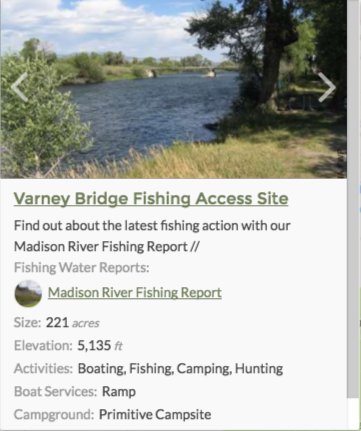 Where available you will also see Reports from other anglers who visited that access site and details such as size of the access site (in acres), elevation, activities, boat services, and sanitation and water availability. 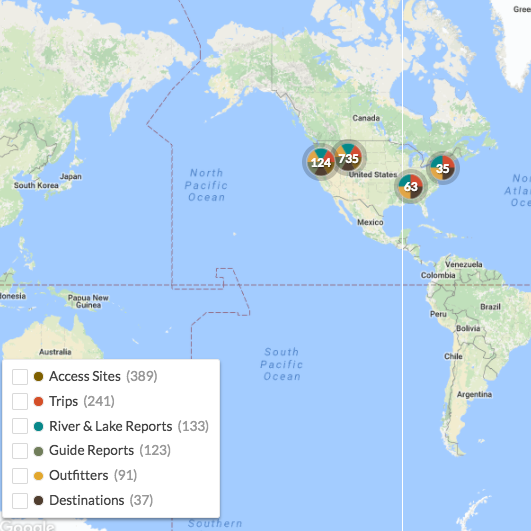 Trips – When you click on a Guided Trip Marker you will see a pop up with the name of the guided trip, reviews (if any) and a link to more information about the trip. You can use this link to find out more about the guided trip and to book a trip online with TU. On the pop up you will also see any pictures (if included) as well as a short description of the guided trip. You will also see links to Fishing Waters on which the trip takes place, any nearby Destinations, the Outfitter offering the trip and other details including price to book the trip, capacity, available days, and duration of the trip. River and Lake Reports – Clicking on a River and Lake Reports Marker will bring a pop up with the name of the river or lake, reviews (if any), and a link to more information about the river or lake. In addition, you will see any pictures available and a short description of the fishing water. 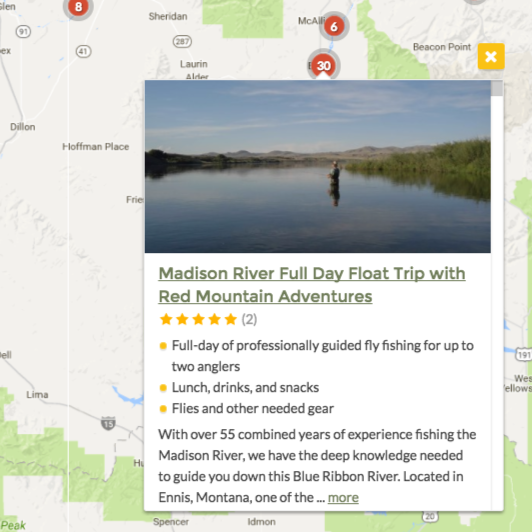 Included in the details are Game Fish Opportunities, Guide Reports (posted by fishing guides) and any included Fishing Trips for the river or lake. You can use these links to find out more about the fishing water and to find and book a guided trip for your adventure. Guide Reports – When you click on a Guide Reports Marker you will see the name of the report, reviews (if any) and the first few lines of the description. To read the entire guide report, click on the link provided. 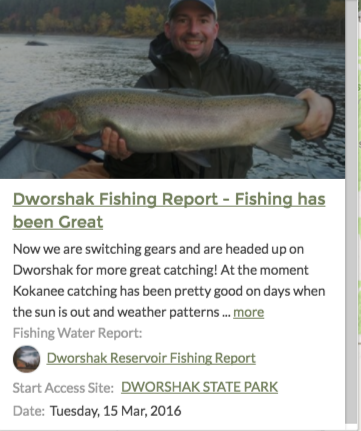 Also included in the Guide Report Pop Up is the Fishing Water Report with general info about the fishing water mentioned in that report as well as any guided fishing trips associated with that post. 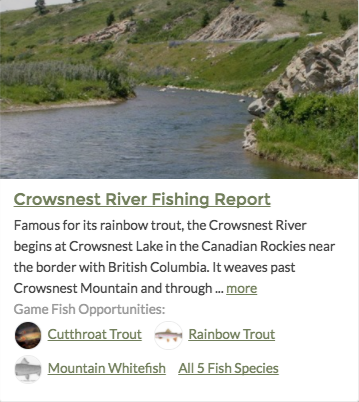 Where available, you will also see details such as the starting and ending access sites, the date the guide report was provided, and the number of fish caught. You can use the links provided to get more details on the river or lake associated with the report. 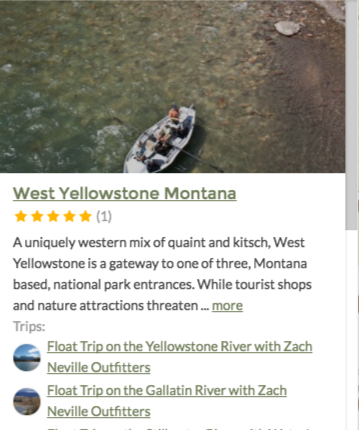 Outfitters – When you click on an Outfitter Marker you will see a Pop Up with the name of the outfitter, reviews (if any), and a description of the outfitter. To find out more information about the outfitter, click on the link provided. You can also view pictures (if provided) by using the left/right arrows on the image at the top of the Pop Up. 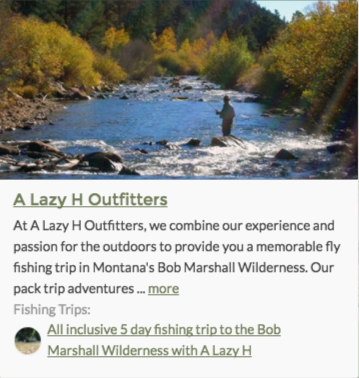 After the description of the outfitter you will see a list of fishing trips offered by the outfitter. You can use those links to learn more about the guided trips and book a trip online with TU. Below the Fishing Trips you will see a list of Guides belonging to the outfitter. You can also use the links to the guides to learn more about the guides and book a guided trip online with TU. Destinations - When you click on a Desintation Marker you will see the name of the destination selected, reviews (if any) a description of the town and a link to more information. Also included is a list of the top guided trips for that location. 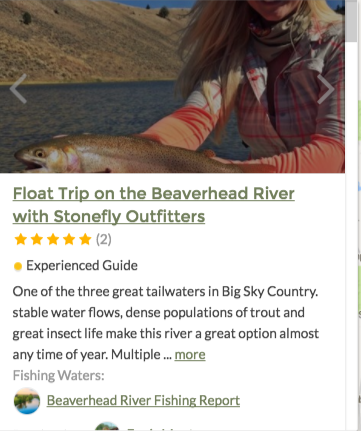 If you hover your mouse over the pop-up and scroll down, you will also see links to Fishing Water reports for that destination and a list of the top blogs (if any) written about that destination.